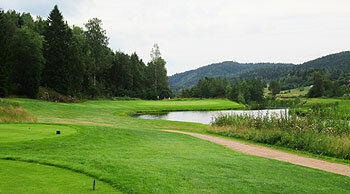 Swedish architect Peter Nordwall may be better known for designing top-flight courses such as Skövde, Stenungsund and Svartinge in his home country, but he is also admired in Scandinavian golfing circles for the top-drawer 27-hole golf complex he created here in neighbouring Norway at the end of the 1990s. The Losby site is only a 20-minute drive to the east of Oslo city centre and it was once a thriving centre for the timber trade. Those days are long gone now but the deforestation of the area in times gone by allowed the construction of a 70-room hotel and two golf courses – the Østmork 18-hole championship course and Vestmork 9-hole course – on the flood plain of the River Losby. Two of the first three holes on the card are tough par fives then four of the next half dozen holes to the turn are demanding par fours – each of them in excess of 400-yards from the back tees. The pick of the front nine is “Styggerann” the 175-yard par three 8th where the tee shot must carry water all the way to a green protected on either flank by bunkers. The river comes into play at many holes on the inward half, especially at the 12th, called “Finnland” – the hole furthest from the clubhouse – which is a 336-yard short par four. Water runs down the right side of the fairway then cuts in front of the green to pressurize both tee shot and approach. Don’t be fooled by the short yardage on this hole – it’s not rated the toughest hole on the back nine for nothing! Losby was delighted when the European Ladies Tour held the SAS Masters competition over their championship course in August 2007 – true recognition that the layout is one of the very best in the country. Fittingly, Norway's Suzann Pettersen lifted the title in fine style, winning by nine strokes from Australian Nikki Garrett. I enjoyed the more undulating front nine on the Østmork course, mainly because I’m not a big fan of water-laden holes, of which there are plenty on the back nine here. Fairways are mainly tree-lined but wide enough to allow a degree or two of latitude for errant shots that end up a little wide of the target – except, that is, on the rather tight downhill 377-metre 4th hole, which funnels down between rock walls on either side of the fairway to the green. I liked the boarding that fronts the green behind the pond at the short 8th hole and the use of this wooden feature to separate the putting surface from a protective water hazard would be repeated again on the back nine. The long par three 10th hole starts the inward half in thrilling style, with tee shots played downhill to a semi-island green on the valley floor. The aquatic theme then continues for the remainder of this nine - holes 12 and 15 have water down EITHER side of the fairway AND in front of the green - so if, like me, you tend to spray the ball around a bit off the tee (or clunk the odd approach shot along the ground) then you’d better have a few spare golf balls in your bag. It’s actually a very beautiful part of the property, where you can’t help but admire the way the holes have been cleverly routed around the many wetland areas. Concluding the round, the home hole plays uphill to a large double green that’s benched into the hillside, adjacent to the 9th green. I believe the business model may have changed here since the golf facility was first established as a country club around 15 years ago and that’s certainly to the benefit of visiting golfers who’ll find it a lot easier now to stay, pay and play at this top class resort venue. Very nice parkland course near Oslo. Has hosted European events and considered by many to be one of the best courses in Norway. Generally in very good condition. Notable holes 3,4,8,9,10,12,15 and 16. Several holes I like on this course, but the 12th always offer a challenge. Par 4 300 meters with water on both sides of the fairway, there is actually plenty of room to land the ball with all clubs in the bag, but it doesnt seem like it. Challenging approach as the green is wide but narrow, a brook in front and shrubbery behind. Beautiful course located just northeast of oslo. Winters are snowy and cold, so it rarely opens before may, but this is to ensure perfect conditions from the get-go.Lots of hazards to lose your ball in here; rivers, ponds, deep bunkers, links-type rough, woods etc. This course requires accuracy from the tee, and concentration to get to the flag at GIR.Facilities are top notch, with the Losby manor comprising a deluxe hotel, restaurant, tennis courts, spa and excellent practice areas.Play this course if you are in Oslo. This is clearly one of norways top 5. Greenfee about 100 USD, book well in advance outside the holidays.